I do NOT accept hacked pokemon and do not provide them. I am in the Eastern Time Zone, and as such, this is the time zone that all negotiations will be done in. Submit offers or requests by PM or by replying to this topic: your choice. I will try to respond ASAP. Note: Will breed for natures, genders, nicknames, egg moves. Last edited by Dare234 on Thu Jan 23, 2014 11:05 am, edited 18 times in total. Edited and bumped as of March 2nd. Edited and Bumped as of March 15th. Updated and bumped as of March 20. Major update and revamp for the grand rereopening for Gen 6. How much value do you put on a breeding pair of marvel scale ? both are untouched. all I'm asking for is a clauncher and a staryu. I'd be willing to give you both Clauncher and Staryu for 1 Marvel Scale Dratini (so 2 credits per Marvel Scale Dratini). I've got jolly quick feet/bullet seed shroomish available. They all have relatively superior IVs. Spore isn't an egg move, you have to level shroomish up to 45 without evolving it and then it learns Spore. I'll trade one for a Choice Band. 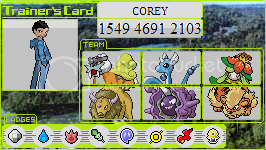 I can get you Gooey Goomy and Amaura if you'd be willing to add the Quick Feet Shroomish and Bulletproof Chespin to our trade today? I can do that. I'll pm you when they're ready. Sweet, would Sliggoo be alright for the ability since it's straight from the friend safari? That's fine. You wouldn't happen to have contagious pokerus would you? I can get you Skrelp, Spritzee, and Electrike if you're still looking for them? I recently obtained a Skrelp but I'm interested in the other tow. What were you looking for in exchange? May I get a Houndour and a Pinsir? Sure thing. I'll pm you when they're ready. Update: Wants and Offering updated.